We’re in the last days of the choir preparation for the church’s Christmas Concert this Saturday night. It’s a BIG deal in the community and a REALLY big deal in our lives. 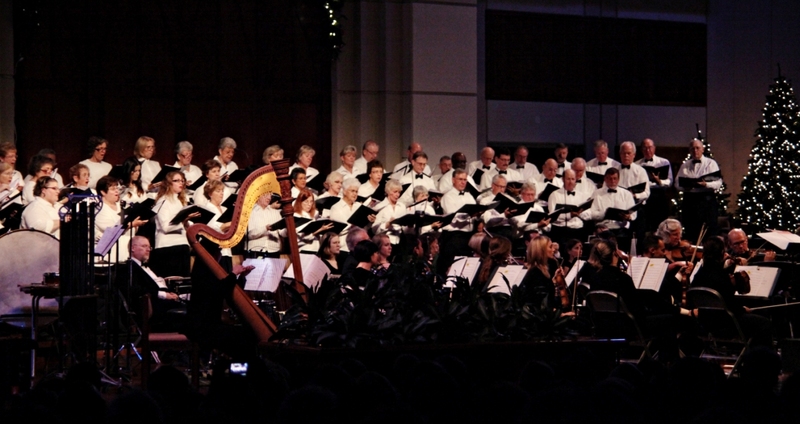 Singing the beautiful music of Christmas with the Florida Philharmonic Symphony, Seven Rivers Chorale, soprano Amy Owens, and even an Irish Band is thrilling…and work. It’s become an up-close-and-personal object lesson for me. Those angels may well have had the same long hours of practice learning words and music so their song could be the perfect proclamation. It’s easy to lose the idea of the very real effort involved in all the Holiness of that night. That night wasn’t just a last minute thing that God pulled off. There was a great deal of preparation moving all “cast” members to the right place at the right time in order to accomplish the reality of “praising God and saying, “Glory to God in the highest heaven, and on earth peace to those on whom his favor rests.” We are privileged to be Part of the Cast of this contemporary Gloria…and a little overwhelmed. This entry was posted in Advent, Birth of Jesus, Christmas Bread, Daily Faith, Luke and tagged Christmas Bread, Daily, Gloria. Bookmark the permalink. It will be magnificent. Be in the moment.